What makes this 2018 F-150 really stand out from other trucks in its class? How about the 100% Military Grade Aluminum body which saves up to 700lb in weight, along with the economy benefits of a lighter much more aerodynamic body design! Then there's the fully boxed frame that incorporates 78% high tensile steel and eight cross members, this is why it can tow 9,100lb and haul 2,080lbs, with a half ton truck! !, this used to be three quarter and one ton territory. Over at the IIHS, the 2018 F150 receives the highest ranking of "TOP PICK" that means top marks in every category, including the new Small Overlap Frontal Impact category in which a lot of manufacturers are still struggling to achieve top marks, this makes the F-150 the safest truck in its class, and all this with Aluminum panels!! 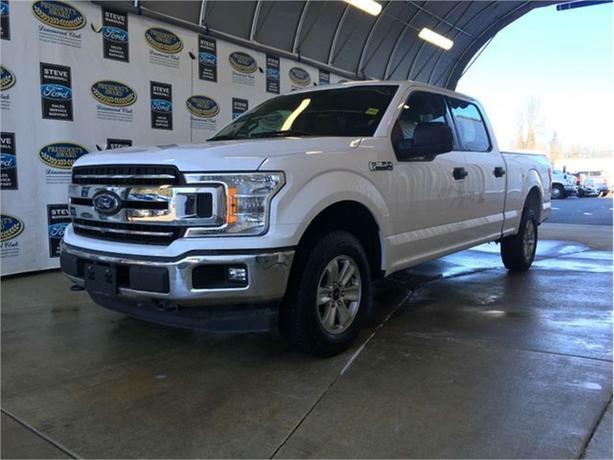 With 395-horsepower and 400lb/ft of torque, the tried & tested Ford 5.0ltr V8 engine has all the smoothness and refinement found in any truck, and class leading economy. Teamed up with an electronic TEN-speed automatic transmission that shifts super smoothly and has a Manual, Sport and towing mode. The 2018 F150 is brisk and energetic off the line, and even when fully loaded with people & toys it musters great passing power. This is one "Ford Built Tough" truck!